CHENGDU, CHINA / ACCESSWIRE / December 26, 2018 / As the year of 2019 is coming, Dujiangyan, Chengdu, China – the hometown to pandas, sent the sincerest invitations worldwide: in order to solemnly commemorate the 2,275th anniversary of the construction of Dujiangyan Water Conservancy Project, Dujiangyan will dispatch “friendship ambassadors” to distribute 2,275 invitations in many cities worldwide and express their gratitude to tourists for their care and protection to Mt. Qingcheng – Dujiangyan scenic area in many ways. Dujiangyan Water Conservancy Project, located at the upper reaches of Yangtze River in China, is the only reserved large-scale water conservancy project with the longest history and is featured by channeling water without dam so far in the world, and it is honored as “the ancestor of the world water conservancy culture”. The construction of Dujiangyan Water Conservancy Project also abides by the natural law of Taoism: “one creates two, two creates three and three creates everything”, “take advantage the favorable situation” and “adjust to changing circumstances”, which have been benefiting human until now. Over more than 2,000 years, Dujiangyan Water Conservancy Project has played the important role of flood control and irrigation, making Chengdu area “the land of abundance” with vast fertile land, where people have never suffered from any flood or draught since then. Mt.Qingcheng and Dujiangyan, integrating the world’s water culture, farming culture, Taoist culture and Panda culture into a whole, are the crystallization of the wisdom of ancient Chinese people and an epoch-making masterpiece of Chinese culture. Especially after being added on the list of world cultural heritage, world natural heritage and Heritage Irrigation Structures successively, Mt.Qingcheng- Dujiangyan attracts the attention from all over the world and is favored and pursued by the world’s tourists. As the tourist attraction with a long history, Mt.Qingcheng – Dujiangyan becomes the window for overseas tourists to learn about the development history of Chinese civilization and nation by presenting many wonderful memories to tourists and is known as “the journey to the most beautiful oriental culture”. It is said that Dujiangyan will usher in the 2, 275th anniversary of constructing the project in 2019. For better commemorating a number of our ancestors creating so many world heritages and carrying forward the common spiritual wealth of human society, Mt. 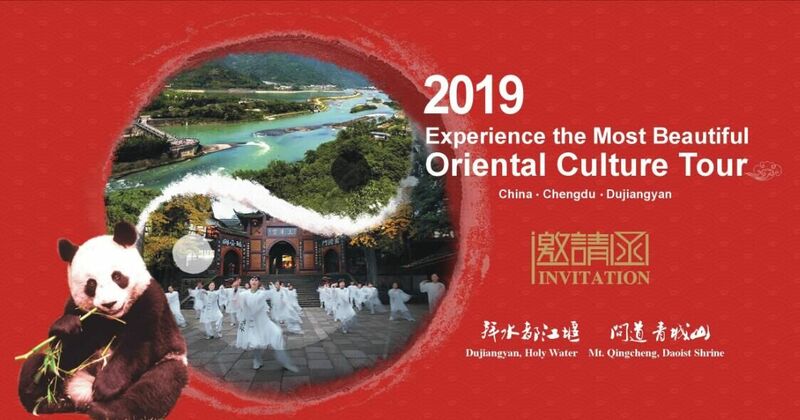 Qingcheng – Dujiangyan Scenic Area specially made 2,275 global invitation letters elaborately to invite the guests from different cities all over the world to experience the “journey to the most beautiful oriental culture” at Mt.Qingcheng – Dujiangyan Scenic Area. It’s worth noting that 256 invitation letters in 2,275 are directed at inviting some celebrities; the other 2,019 invitation letters represent the New Year’s wishes of the scenic area, and 10 “Friendship Ambassadors” will be entrusted by the scenic area to distribute the 2,019 invitation letters to the tourist representatives who want to personally experience the “journey to the most beautiful oriental culture” from the cities such as Beijing, New York, Sydney, Paris, Moscow, and Singapore on the eve of the new year of 2019. As the responsible person of Mt. Qingcheng-Dujiangyan Scenic Area introduces, the 2,275 invitation will be valid within 2019, and these invitations will become the “special pass” for the invited guests to freely enter Dujiangyan scenic spot. In this activity, besides freely visiting the famous scenic spots such as Lidui Park, Dragon-Taming Temple, Yuzui Water-Dividing Dike, Baopingkou Water Inlet, Erwang Temple, Anlan Suspension Bridge and Yulei Pass, the guests can also enjoy the wonderful programs such as “Mt.QingchengTai Chi Dance”, “Prefecture Chief Inspects Ancient Weir”, and “Baby Panda Quick Flash”. In recent years, there are more and more international direct flights to Chengdu. Meanwhile, from January1, 2019, Chengdu will implement the 144- hour transit visa exemption policy. Tourists from lots of countries and regions in the world such as America, Australia and France can take a direct flight at weekends to spend holidays in Mt.Qingcheng and Dujiangyan near Chengdu. The journey to China on the New Year of 2019 – “the journey to the most beautiful oriental culture” with full of legends is worth your expectation and experience.